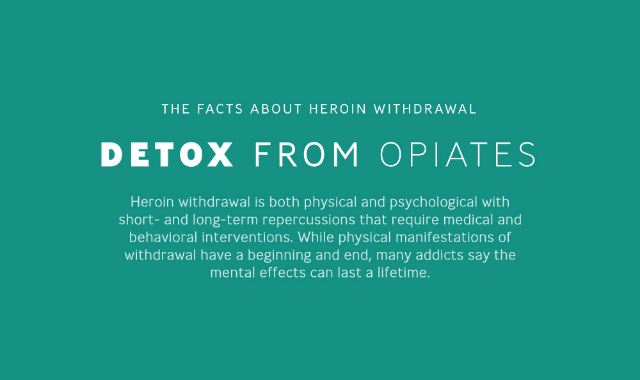 Heroin Detox & Opioid Withdrawal #Infographic ~ Visualistan '+g+"
Finding Help With Detox, Withdrawals and Rehab Addiction is a beast, but the good news is that there are ways to help those with a heroin or other drug problem. The first step is for the addict to recognize the problem and get help. It’s not an easy path, but with the right emotional, psychological, behavioral, and physical support, it is definitely the desirable one. Detoxification usually starts with administration of a medication to ease a person struggling with addiction off of the opioids. Drugs like Naloxone, Suboxone and Naltrexone are used to act on the same structures and processes of the brain as an opiate, but protects and normalizes it instead. Physical withdrawal symptoms then start presenting themselves in the next three to 10 days. It can be a long, arduous process. The right plan, tools, and support, can help an addict gain control over their addiction. There are many steps along the way that combine emotional and medical therapy methods. It’s a long fight, but it’s a fight worth taking on. With rehabilitation, individuals who struggle with addiction can get the support they need - including help with fitness, nutrition and preventing relapse. Learn more from the infographic here.